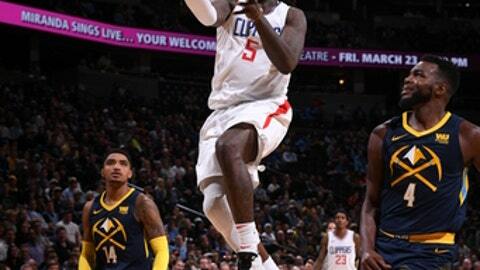 DENVER (AP) The Los Angeles Clippers drew on their reserves to mount an unlikely comeback. Austin Rivers added 17 points and Montrezl Harrell had 15 for the Clippers, whose bench outscored Denver’s reserves 54-4 in the second half. ”It’s a great example why you play the games,” Clippers coach Doc Rivers said. ”There are things that happen that you don’t account for. We get down and we put that (all-reserve) lineup on the floor that I guarantee they never scouted because we never used it and it worked for us. ”We had the entire bench on the floor and the entire starting lineup was up cheering and giving guys water. That’s what teams are and it was nice to see,” Rivers added. ”Sometimes you have different lineups in that get the job done, so tonight was like that,” Williams said. Gary Harris had 23 points to lead the Nuggets, who lost consecutive games at home for the first time this season. Paul Millsap had nine points and seven rebounds in 23:26 minutes of play in his return from a left wrist injury that had sidelined him for the last three months. Leading by six at the half, the Nuggets stretched their lead to 19 points on a layup by Harris but the Clippers fought back to within seven points going into the fourth quarter, outscoring the Nuggets 18-6 over the last 4 1-2 minutes of the third. Denver pulled to within a point on a layup by Wilson Chandler but the Clippers scored three consecutive baskets, capped by a dunk by Marjanovic for a 115-108 lead with 3:14 remaining. The Nuggets were down 119-118 after Harris’ 3-pointer with 15.1 seconds remaining. The Nuggets then fouled Williams who made both free throws and Jamal Murray made a pair of free throws with 8.1 seconds to go. Austin Rivers was fouled and made one of his two free throws with 7 seconds left, but Denver did not get a final shot off before the buzzer when Murray lost the ball as he drove toward the basket, poked away by Rivers in a game-sealing defensive play. Millsap entered the game for the first time midway through the first quarter – his first action since tearing a left wrist ligament Nov. 19 against the Los Angeles Lakers. He muscled in a layup for his first points of the game and banked in a 3-pointer from 26 feet away to culminate a 17-4 burst over the last four minutes of the opening period. Clippers: F Danilo Gallinari, formerly a member of the Nuggets, missed the game against his old team because of a bruised right hand. … G Avery Bradley remains sidelined by a sports hernia. Nuggets: F Torrey Craig missed a fifth consecutive game with a left hamstring strain but coach Michael Malone said he is making progress and could possibly be ready Friday night when the team plays at Memphis. Clippers: Completes a back to back set Wednesday night by hosting Houston. Nuggets: Open a three-game road trip Friday night at Memphis.